Almost as soon as the paint was dry, residents of the city were posing for pictures on the uneven and rundown, but newly bright, steps connecting Findikli to Cihangir, a liberal neighborhood frequented by artists. Other Turks on the social network, assuming that the painting project was related to calls for equal rights for lesbian, gay, bisexual and transgender people in Istanbul, posted messages of solidarity. 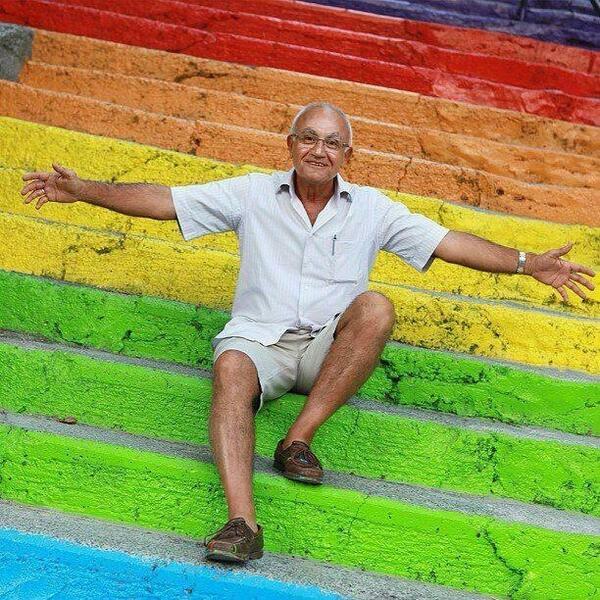 Huseyin Cetinel who painted the stairs in LGBT colours. 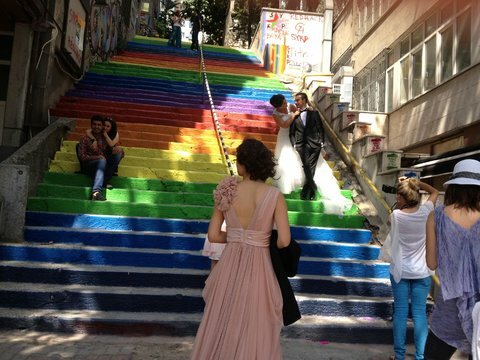 To the mainly young, educated and liberal Turks who rallied this year against the autocratic tendencies of the ruling, Islamist Justice and Development Party, the covering of the rainbow stairs seemed to be yet another sign of intolerance and a lack of respect for their right to claim public space. The next day, as calls to repaint the Findikli stairs in bright colors spread on Twitter and Facebook, the Beyoglu municipality first denied, then admitted, that it was their workers who had painted the stairs gray. 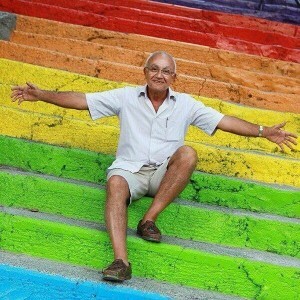 Before the municipality joined the effort to bring back the rainbow look, people across Turkey had already taken up brushes in solidarity and painted public stairs in their cities in similar colors. “Slowly, Turkey’s stairs are picking up rainbow colors, don’t you think it’s more beautiful this way?” a Twitter user wrote last Saturday. “The most colorful protest,” a local newspaper announced over a collage of images of projects from Ankara to Izmir. For many Turks who visited the Findikli stairs this weekend, the paint duel seemed to be yet another demonstration of a government bent on controlling their public and private lives. Rather than cementing government control, any sense of oppression brought more people out into the streets, she added, so authoritative policies were doomed to fail. “I would not have come here if they haven’t repainted this over in gray, so here I am with others,” she said. On Sunday, a bride, Gamze Ozmermer, showed up with her groom at the Findikli stairs to pose for wedding photographs. “Where could be a better setting?” Ms. Ozmermer said, neatly adjusting her veil.